KlakNDI is a Unity plugin that allows sharing video frames between computers using NDI. NDI (Network Device Interface) is a standard developed by NewTek that enables applications to deliver video streams via a local area network. It provides a high quality, low latency and performant way to mix multiple video streams sent from several applications/devices without the need of a complex video capturing setup but only a wired/wireless network connection. The iOS plugin only supports the sender functionality due to a limitation of the NDI SDK. The plugin is presented in a self-contained form on Windows and macOS. 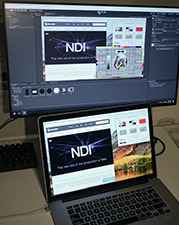 The NDI SDK is required when building to iOS. You can also use Git support on Package Manager to import the package. Add the following line to the dependencies section in the package manifest file (Packages/manifest.json). Note that this feature is only available from Unity 2018.3. See the forum thread for futher details. The NDI Sender component (NdiSender) is used to send frames to NDI-enabled systems. The NDI Sender component runs in the camera capture mode when attached to a camera object. It automatically captures frames rendered by the camera and publish them to a network. The dimensions of the frames are dependent on the screen/game view size. Note that the camera capture mode is not compatible with scriptable render pipelines; The render texture mode should be applied in case of using SRP. The NDI Sender component runs in the render texture mode when it’s independent from any camera. In this mode, the sender publishes content of a render texture specified in the Source Texture property. This render texture should be updated in some way – by attaching to a camera as a target texture, by custom render texture, etc. The Alpha Support property controls if the sender includes alpha channel to published frames. In most use-cases of Unity, alpha channel in rendered frames is not in use; it only contains garbage data. It’s generally recommended to turn off Alpha Support to prevent causing wrong effects on a receiver side. The NDI Receiver component (NdiReceiver) is used to receive frames sent from a NDI-enabled system. The NDI Receiver tries to connect to a sender that has a name specified in the Source Name property. It can be manually edited with the text field or selected from the drop-down list, which shows currently available NDI senders. The NDI Receiver updates a render texture specified in the Target Texture property every frame. Note that the receiver doesn’t take the aspect ratio into account. The dimensions of the render texture should be manually adjusted to avoid stretching. When a renderer component is specified in the Target Renderer property, the receiver overrides one of texture properties in the renderer using a material property block. This is a handy way to display received frames when it’s only used in a single instance of renderer. Received frames are also accessible via the receivedTexture property of the NdiReceiver class. Note that the receivedTexture object is destroyed/recreated when frame settings (e.g. screen dimensions) are modified. It’s recommended updating the texture reference every frame. NDI vs Spout/Syphon: Which one is better? The answer is simple: If you’re going to use multiple apps on a single computer, and those apps support Spout/Syphon, you should use one of them. NDI is just overkill for such cases. Spout/Syphon are superior solutions for local interoperation. They’re faster, low latency, more memory efficient and better quality. It’s recommended using Spout/Syphon unless multiple computers are involved. It was observed that the plugin worked significantly slow on some MacBook devices with dedicated graphics. It’s probably improved by switching to integrated graphics. From Unity 2018.3, GPU in use can be implicitly selected in the Preferences panel. Please try changing it when significant slowdown is observed. The NDI dynamic library files (Processing.NDI.Lib. *.dll, libndi. *.dylib) contained in the plugin internal directory is provided by NewTek, Inc under the NDI® SDK License Agreement. Please review the original license when distributing products with the plugin.